Beyond the display of goodwill, what will US President Barack Obama offer India during his forthcoming visit? That is a question that appears uppermost in the minds of Indian analysts as the president's 6-8 November visit to Mumbai (Bombay) and Delhi approaches. Twelve years after India carried out nuclear tests and was pilloried by America, bilateral relations between the two countries stand transformed. Dialogues and meetings continue to mushroom, but there will be many questions for Mr Obama to answer. Just three American presidents came to India in the three decades after the country became independent in 1947. But, with Mr Obama, three US heads of state will have made it to Delhi in the past decade. The distrust of the Cold War has long gone; instead, both countries want to see what more can be done together. President Obama's decision to stay at the Taj Mahal hotel in Mumbai, one of the sites of the gun-and-grenade attacks in November 2008, is full of symbolism. But leading lights of the Indian strategic community are consumed by other concerns - what will happen to Pakistan and Afghanistan after the US quits that troubled country? How will India then cope with the regional situation? "If the US moves out of Afghanistan, the principal question in formulating Indian foreign policy will be how to deal with Pakistan," VR Raghavan, who served as India's director-general of military operations, told the BBC. Washington, Mr Raghavan argued, had shown limited commitment to fighting the global war on terror - tailoring its efforts to deal with elements that directly threatened American national interests. India and Pakistan, and their relationship with Afghanistan, have long bothered the US and President Obama himself. Journalist Bob Woodward, in his fly-on-the-wall account Obama's Wars, quoted the president at a White House meeting in October 2009: "We need to move aggressively on India-Pakistan issues in order to reduce tensions between the two countries." That suggestion, Mr Obama is likely to find, doesn't have many takers in India. Prime Minister Manmohan Singh wants rapprochement with Pakistan, but no one really expects any dramatic forward movement in dealing with Pakistan. Another question raised repeatedly by Bob Woodward in his book - the duplicity displayed by Pakistan in dealing with hardline Islamist groups (an issue with which Mr Obama is more than familiar) - continues to bother many Indians. "Washington has not been successful in rolling back Pakistani duplicity," says Rana Banerjee, who works with the Institute of Defence Studies and Analyses in Delhi. "They have no option but to deal with Pakistan." Briefing journalists after a 30 October meeting between PM Singh and US Secretary of State Hillary Clinton in Hanoi, a top Indian official, Shivshanker Menon, said that American arms supply to Pakistan not related to counter-terrorism was certainly an issue. A leading Pakistani analyst and writer, Ayaz Amir, told the BBC that the US-Pakistan relationship was defined by the Afghan conflict. "The US is in deep trouble in Afghanistan. They cannot do without Pakistan to tackle Afghanistan, yet we are being made a scapegoat," Mr Amir said. "The Pakistani military is already over-extended in the [North-West] Frontier. It cannot go any deeper. "The American agenda is to have Pakistani troops in North Waziristan," he said, adding that tensions arose if Pakistan did not play ball with the US. Ayaz Amir believes that fatigue has set in and there are no outlines of a political settlement in Afghanistan. "When the Americans pull out, it will be like the chaos that prevailed when the Soviet Union finally withdrew from Afghanistan in 1989. "The surges and the drone strikes are just not working. The reservoir of manpower [available to the extremists] is so tremendous," he added. So, while Mr Obama doesn't travel to Pakistan in this trip, the country will loom large during his visit. Unlike British Prime Minister David Cameron who spoke openly about Pakistan, Mr Obama could be more oblique - preferring to speak in general terms. That, however, may not satisfy Indians. "India's security is endangered. President Obama must talk about India playing a larger regional and global role. He must say that India's security is important to the US," former Indian national security adviser Brajesh Mishra, who crafted a closer relationship with Washington, told me. 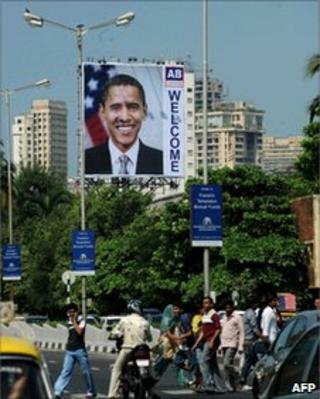 Welcome to a rising and demanding India, President Obama.